Hobby Wing "SeaKing" 30 v3 Amp ESC. External Programming Port: Not available. 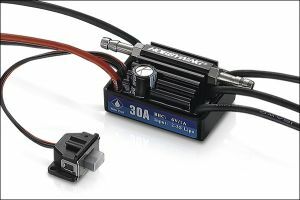 But the Rx wire on the ESC can be used to connect the LED program box with ESC. 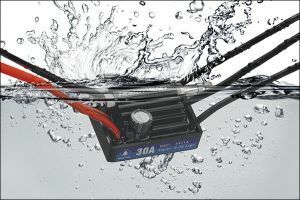 This esc is suggested for smaller boats upto the 16" (400mm) range. Because there are so many variables with each hull and installation its impossible to specify all the applications for this esc. If you have any questions on using this esc with your particular boat, please contact us before purchase.